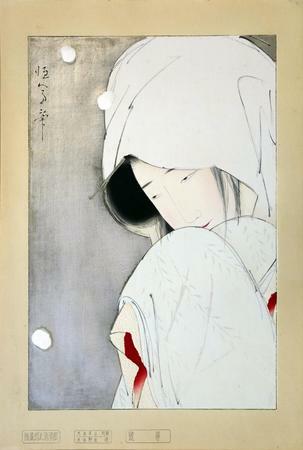 Around 1925, Tsunetomi's most famous woodblock print, Heron Maiden (Sagi musume), was published by Nezu Seitaro in a limited edition of 100 prints. Featuring a striking silvery mica background and gofun snowflakes, this print is a masterpiece of minimalist design. 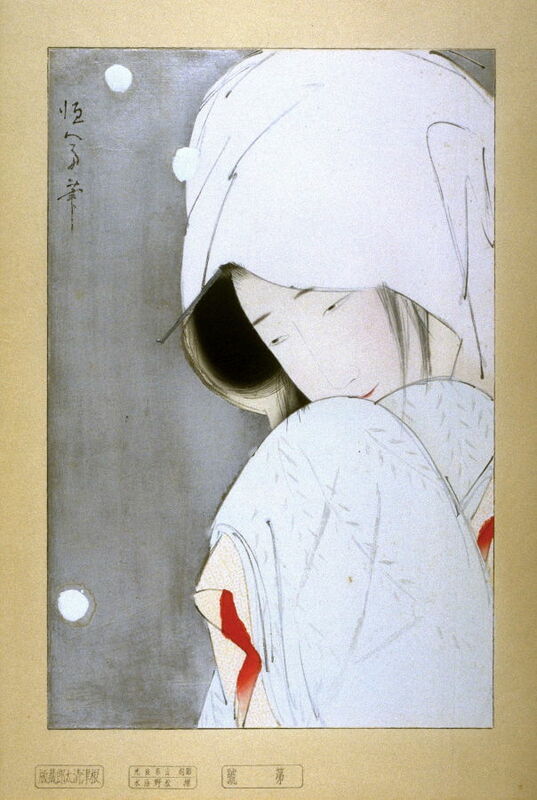 The carved lines in the woman's clothing and face capture the spontaneous quality of Tsunetomi's original brushstrokes while the rather stark colors - primarily white, gray, and black, punctuated by small areas of bright red - underscore both the feeling of winter and the other-worldliness of the subject matter. This information is taken from Hanga Gallery. During the 1980s, the Japanese publisher Ishukankokai recarved the blocks for Heron Maiden and issued a posthumous edition, also limited to 100 prints - publisher information is printed in the left margin in this later edition. Illustrated in black and white in 近代日本美人画展 : 伝統木版画を支えた作家たち Exhibition of Modern Japanese Beauties: Meiji, Taishō, Shōwa, Riccar Art Museum, 1982, n.p., no. 64. There is another copy of this print in the St. Louis Museum of Art.